Parveen is an 18 year old girl living in Izzatnagar Bareilly. 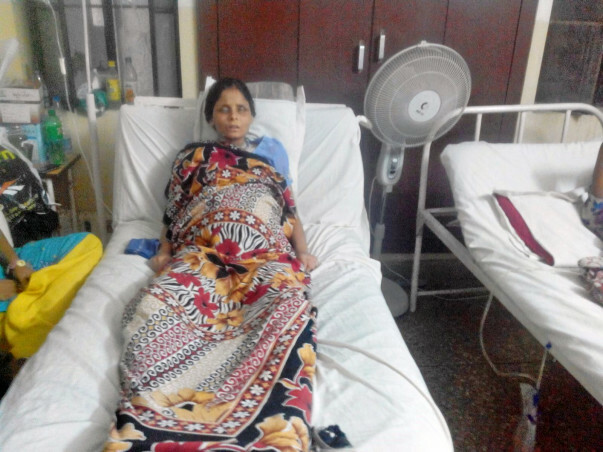 She is an orphan and is suffering from SEVERE SUBACUTE PANCREATITIS WITH PSEUDO CYST AND ASCITES. Since one month, she was having pain in the abdomen and went to see the doctor when it was unbearable. She is on bed and given treatment for pain and infection but not of what she actually had to be given i.e. endoscopic surgery and placing of stent to by pass her enzymes to deudonem where it belongs not abdomen and lungs. Her organs are dissolving and converting into dead cells, proteins and sugar. She is being admitted to G.K. Srivastava hospital pvt. ltd. rampur gardens, Bareilly U.P. The cure of her illness is an MRCP test (Magnetic resonance cholangiopancreatography), in medical imaging, a technique to visualise the biliary tract and pancreatic ducts and to detect leakage from pancreatic, which is not available in bareilly. After detecting leakage it has to be corrected by endoscopic surgery. She is not getting this treatment but she is kept without food so as to not stimulate her pancreases and is given antibiotics- Meropenen & Sulbactam inj. and albumin i.v. Due to ascitis her abdomen cavity and lungs are filled with watery fluid and the unbearable pain due to the dissolving of her internal organs. 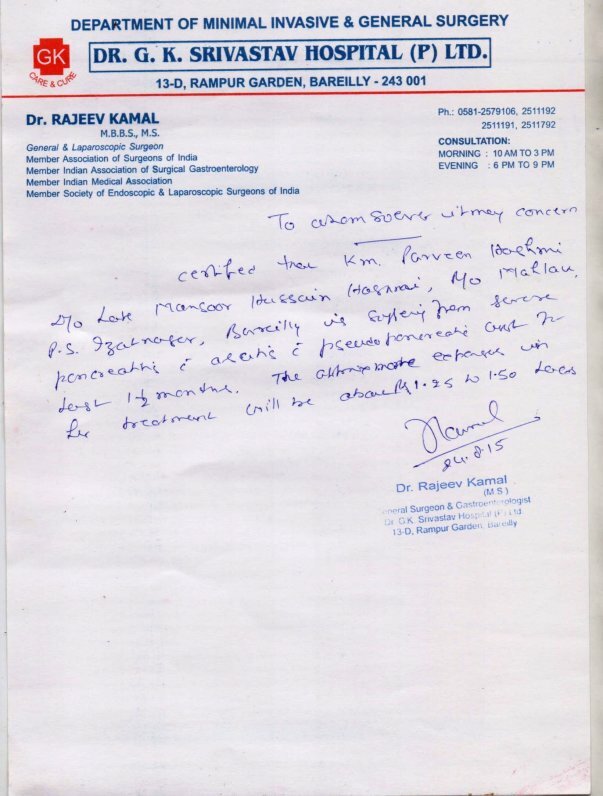 The Treatment is costing aproximately 1-2 lakhs including other medical expenses. Please find the letter from the doctor above.